In 1894, business was going through a depression. Many men turn to mining during hard times because of the potential of sudden wealth, and the possibility of at least equaling current wages at a time when few jobs are available. Perhaps Hamilton was not thinking of riches, but when he decided to pan some of the clay that came from his hill, he noticed specks of gold. After two years of occasional prospecting with his son, Hamilton traced the gold float to an outcropping on his hill that assayed $35 per ton. Charles Graves had come from Kentucky in 1882, and owned a ranch on the south side of Hamilton Hill. Graves invited the Hamiltons to stay at his ranch while they worked. When Graves got curious, Hamilton told him of his discovery and suggested to Graves that he stake some claims. His Home No. 1 and No. 2 were so named because they lay close to Graves' ranch. Hamilton's first ore shipment yielded him $46,000. With some of this money, he built a two-stamp mill in 1898. In 1900, Hamilton had sold one of his claims for $100,000. In 1902 a five-stamp mill was built a mile south of the claims. During this period, Hamilton purchased 160 acres of Willow Springs from the Beale estate for $3,500. With his riches, Hamilton built attractive stone houses at Willow Springs, which he attempted to develop as a health resort. He dabbled in the silkworm industry, grew fruit and shade trees, grapes, and constructed an ice plant in Willow Springs. 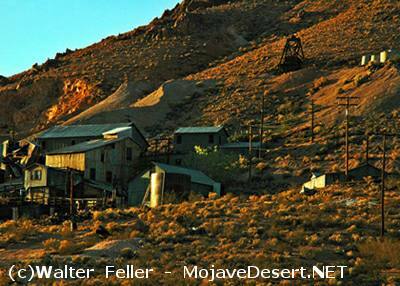 Hamilton even built a hotel in Rosamond for the travelers coming into the area his mine made popular. H. Clifford Burton began working for the Tropico Mining and Milling Company in 1912. By June, 1914, he was promoted to superintendent due to his previous studies at an assaying school, which helped him to solve problems in the milling process. The Tropico Mine had a ten-stamp mill and a thirty-ton cyanide plant. The Tropico Mine was inactive during the First World War, and Clifford Burton returned from the war with his brother Cecil to work again at Tropico. During the inflationary 1920s, the company was not operating at a profit and assessments were levied on Tropico stock. The only ones who wanted to buy Tropico shares were the Burton brothers. By 1934, they had acquired alt outstanding stock. From 1933 to 1942, after having successfully predicted the location of orebodies, the Burton brothers' Tropico Gold Mines prospered at its highest level ever. The custom ore mill reached a peak production in 1939 with 400 miners shipping their ore for treating. Burton Company trucks would haul much of the ore to the mill. The Burtons paid for this ore as it was assayed. The Burton brothers owned the Ruth Mine near Trona in 1942 when Limitation Order L-208 shut it down. The shutdown was so rapid and improperly carried out that the Ruth Mine, and many others throughout the desert were never reopened. Tropico was closed by the same order, but rock from Tropico Hill was used in the Construction of airstrips in the Antelope Valley, and for this reason the Burton brothers could keep a small crew on site that helped keep the mine dewatered and timbering intact.